What are the benefits of attending Girls State? When and where is Buckeye Girls State? The number of girls in each state is determined by the state Auxiliary's available resources. Citizens are divided into two mythical political "parties". The parties do not reflect the two major political parties in today's system, but allow Citizens to gain a special knowledge of how the system works. Elections are held to fill city, county and state positions. Activities include government workshops, legislative sessions, campaigning, party rallies, debating, voting. The Citizens also receive instruction in Parliamentary Procedure. This "hands on" method is unique and extremely effective. Girls State affords participants an opportunity to live together as self-governing citizens by informing them about the duties, privileges, rights and responsibilities of American citizenship and hopefully encourages their participation in the democratic process as they progress into adulthood. Additional activities include: journalism, law enforcement, music, field trips, group devotions, and patriotic ceremonies. Through hands-on experience young women have the opportunity to not only learn the mechanics of local and state government; but also learn citizenship and patriotism; gain self-confidence, poise and character. Attendance also makes participants eligible to apply or be selected for awards, honors and scholarships as outlined in the scholarship section. Attendance also provides Delegates with the opportunity to apply or be selected for awards, honors and scholarships. This includes Girls Nation, United States Senate Youth Program, the Samsung Scholarship and the Buckeye Girls State Endowment Scholarship. Buckeye Girls State is currently held on the campus of the University of Mount Union, Alliance, Ohio. The program is usually held the second or third week of June. The 2011 program begins with registration on Sunday, June 12th and ends with the closing program on Saturday, June 18th. Each girl must provide her own transportation to and from Buckeye Girls State. 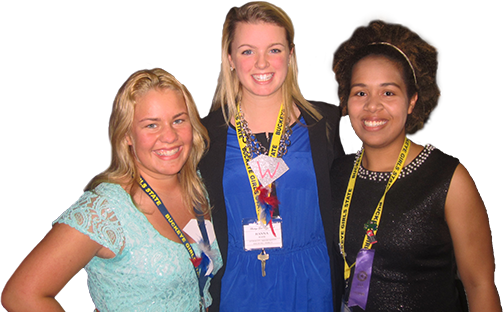 Girls State Delegates are sponsored through local American Legion Auxiliary Units and Posts of The American Legion. Other interested organizations in the community may also contribute to this sponsorship. The sponsorship fee covers the full expense of the Delegates meals and accommodations. Anyone interested in cosponsoring a Delegate, should contact the American Legion Auxiliary Department Headquarters in Zanesville, OH at 740-452-8245 or your local American Legion Auxiliary. Staff comes not only from volunteers of the American Legion Auxiliary but also from the field of education, government, former Girls State participants and people who are interested in furthering the program. Counselors, state and local government, public officials and speakers participate and provide guidance in their respective fields of expertise. If you would like to serve in a staff position please contact the American Legion Auxiliary Department Headquarters in Zanesville, OH at 740-452-8245 and let us know what area you would be interested in and what you feel that you could offer the program.